A showcase of dances by students of Aurora Dance School, Faculty members and Aurora Dance Company. All in an afternoon followed by High Tea. Teachers and students have a unique and long lasting bond. We all have fond memories of those who have shaped us. Welcome friends and our extended family. 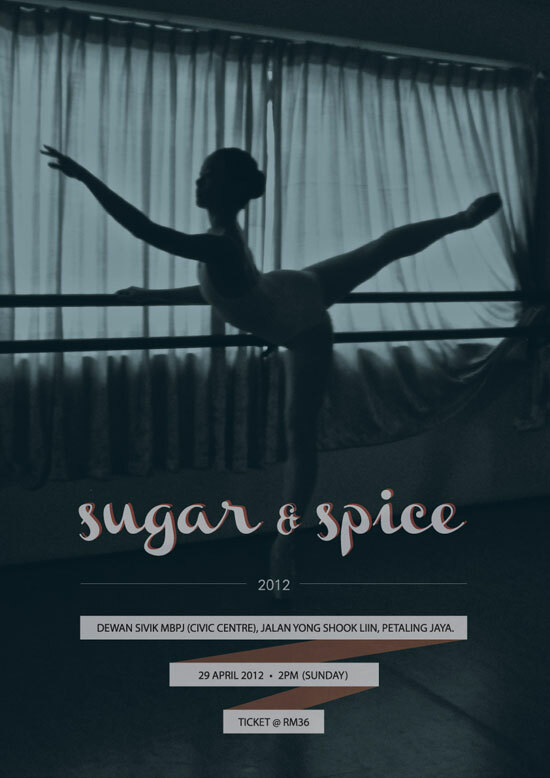 The preparations for Sugar & Spice 2012 began in late November last year after another successful season of dance examinations and the 1st Malaysian International Imperial Ballet Awards Competition. In between dance lessons and concert rehearsals, many of our young talented students were in training for numerous television and stage performances as well as theatrical and dance sport competitions. This afternoon’s concert will showcase close to 240 dancers performing in a variety of dance styles from around the world as well as vocal and instrumental contributions from our faculty members. There will be a prize presentation for our students who earned Distinction in their Classical Ballet , Modern Theatre and Ballroom Dance examinations. My heartfelt thanks go out to my team of teachers for their beautiful choreographic works , the administration staff who have worked so hard behind the scenes, parents for their strong support and not forgetting the performers whose passion n tenacity have made this afternoon a realization. The school has become nationally, regionally and internationally renowned. I am indeed humbled by the continuing level of support shown by all. Let us now sit back and enjoy.